Congratulations to Aimee for winning the Swag pack from Purina! I have already emailed her and she has 24/hrs to respond before I pick another winner! Thank you all for entering! 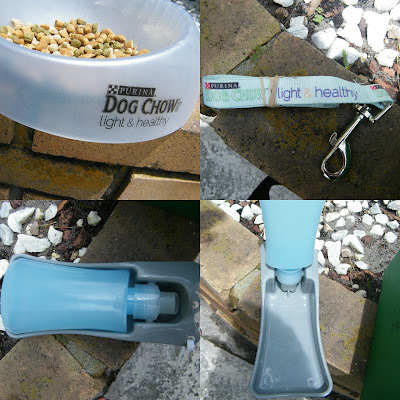 There are other Purina giveaways going on as well currently on other blogs so don't forget to check those out! I have something pretty exciting today! If you read my Purina Light & Healthy Review that I did yesterday (HERE), you know how much Kyri and Rosie loved the food. WELL! The amazing people at Purina are offering to send one winner one 4-pound bag of their new Light & Healthy food AND some other amazing things! I have everything from the kit they are going to be sending the winner and all I can say is that Rosie and Kyri absolutely love everything! The kit is PERFECT to go out and do some activities with your dog! It is only open to the continental United States. I'm really sorry to all of you who are overseas. The winner will be contacted by the email provided either in comment or in the rafflecopter portion. Said winner will have 48 hours to respond to the email. Purina will be sending the prize kit out accordingly. This giveaway is being sponsored by Purina. A healthy dog is important to use b/c we want our dog to be around for as long as possible!! a healthy dog is extremely important, it means a better quality of life for your furbaby. You want to give them best so they will feel their best. Amen to that! Rosie is pretty old, but we've been keeping her healthy and active and it's been helping her feel like a puppy! A healthy dog lives longer and I don't ever want to part with my dogs! A healthy dog is important to our family because having a dog has added such joy and happiness that only a dog can bring... and if that pup isn't happy & healthy, we wouldn't be either! When everybody's healthy, everybody's happy too. Having A Healthy Dog Brings Complete Happiness To My Family, Healthy And Happiness Is So Important. I hear you on that! I will definitely be heartbroken when Rosie goes. :( She's an old lady! I definitely agree with you on that! Rosie and Kyri bring a lot of joy to our house! Where as Anya, she uhm she's just cranky hah! The healthier your dog is the better for the whole house hold. Less vet bills and more fun. My dog is part of the family so I always want her to stay healthy! Our Boxer Loki is like one of my kids so it's important that I feed him and treat him like I do with my children so they can all be healthy! I want my dogs to be members of our family as long as possible. Keeping them healthy and happy is a responsibility I take very seriously. Having a healthy dog is important to our family because we want her to feel good and be around for as long as possible. his health is important because we want him to be a member of the family forever! Our dog is a member of our family! Keeping her happy & healthy is very important to us. We've raised him since he was just a baby. His health is just as important as any other member of my family.